I realized that I should follow up on my “What’s Wrong with Bullies” post. While most of our friends on Facebook know how this has all played out, something happened yesterday that made it realize that there are people following this story that don’t have the inside information. I forget sometimes that my blog is public and it still surprises me that anyone reads it. RT @iandesmond20: @ScreechTheEagle shout out to my man with all the #natitude. I like the hat. Bring it to #NatsFest and I’ll sign it. I was floored. 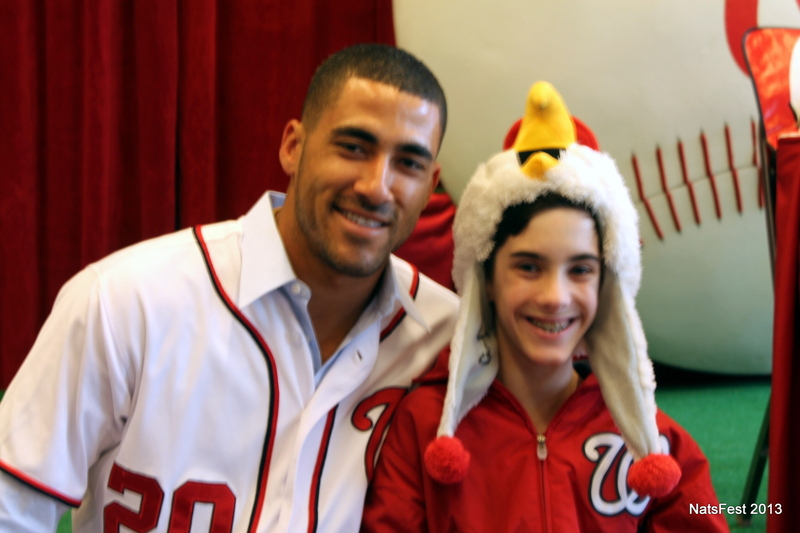 I’ve always known that Ian Desmond is a class act, on the field and off. But, this was completely beyond my expectation. And Jake was thrilled, of course. Suddenly, the jerks at school seemed a lot less important than they had the day before. 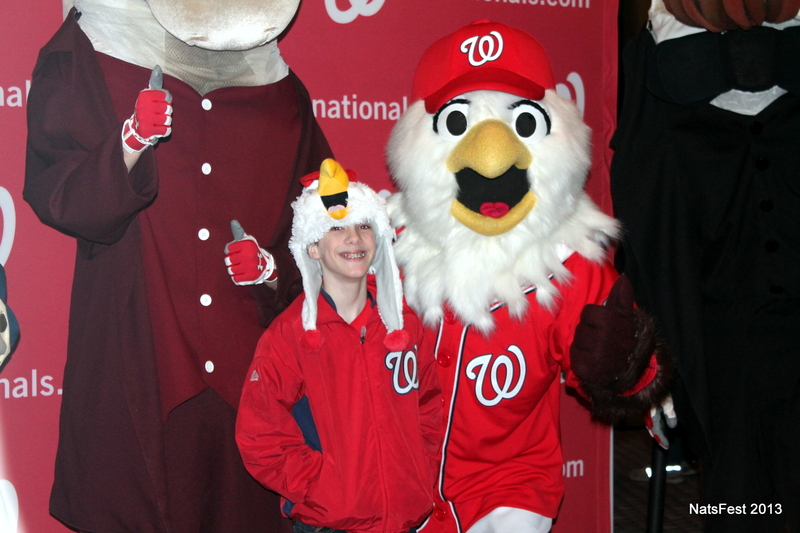 @l8dybug @nationals Wearing a screech hat to school is cool. Even better? Bringing the REAL Screech to school! DM me to make it happen! I exchanged emails with “Screech” and we are going to talk next week to see what we can come up with. (I sure hope he does something other than whistle or at least brings along an interpreter). I am hopeful that whatever we come up with will be well received by the school. We’ll see. Either way, I know that they will be supportive of Jake. The VP is amazing and I know that they are committed to having a bully-free environment at the school. 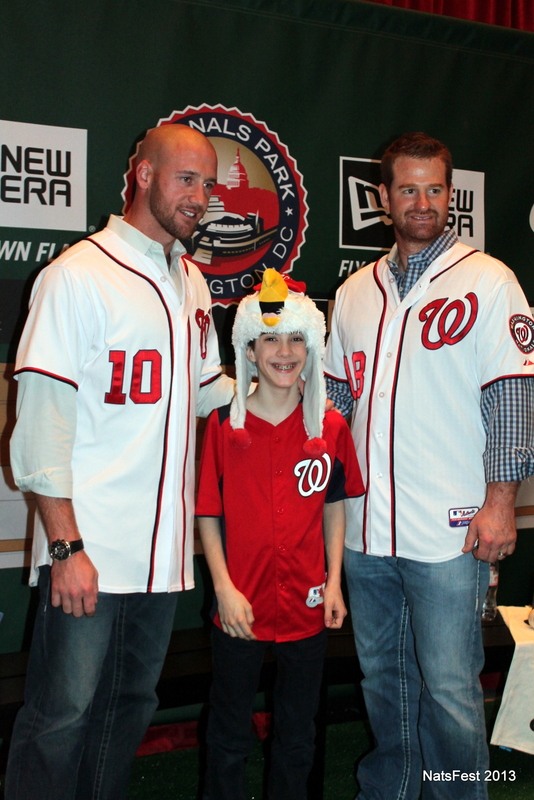 NatsFest was yesterday. Jake woke up with a migraine early in the morning morning and we were afraid that he might not make it. But, he rested and rallied and we had a great time. 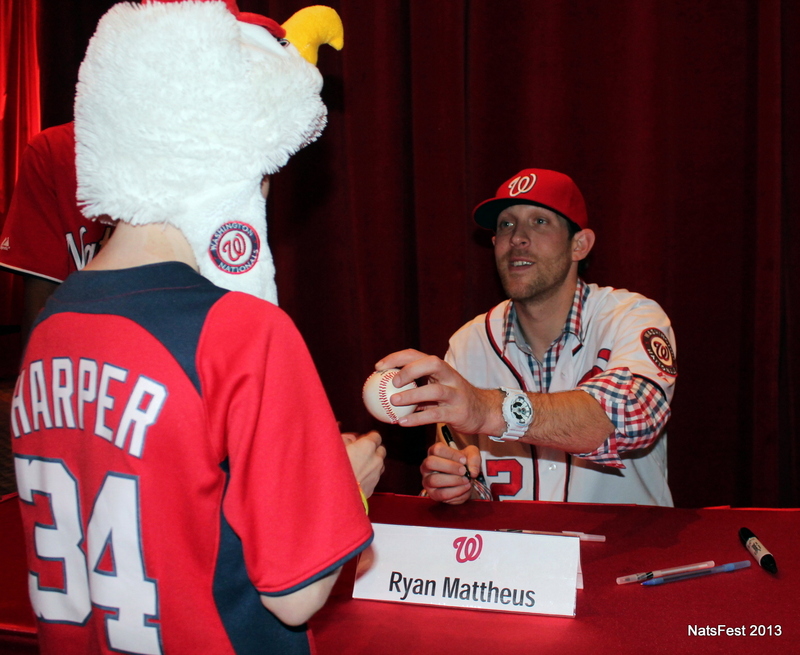 He had his picture taken with the Presidents and Screech and got to get autographs from Tyler Clippard and Ryan Mattheus. Then, a crazy thing happened when we were standing in line for autographs. This woman walked up to us and said, “Are you the boy who blogged about getting teased for wearing the Screech hat?” We said yes and she put her arm around him and told him not to let those kids get to him. After she walked away, Jake and I looked at each other in amazement. That was just surreal. 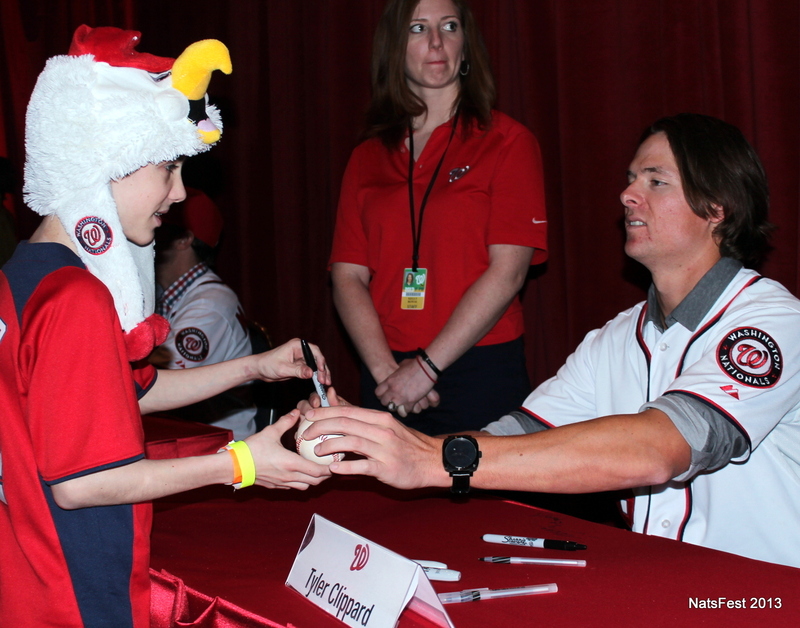 It wasn’t looking good for getting Ian Desmond’s autograph. I told Jake that we were going to have to go home soon and his face fell. I asked him what was wrong and he said that he was just disappointed. I took a deep breath and looked around. I spotted a group of suits standing near by and went up to them and asked if I could tell them a story. I relayed the whole situation and asked if there was any way they could connect us with Ian. One told us to “stay here” and he walked away with his phone to his ear. He came back a few minutes later and told us that Ian would be doing story-time downstairs in a few minutes but that he couldn’t guarantee anything. We headed down there and I managed to find one of the marketing guys, who I also relayed the story to. He told us to stake ourselves out by the door that they would be taking him out through. As Ian was leaving, Jake called out “Ian!”. He turned and said, “Hey kid…I like your hat”. Then, he stopped and said, “Oh wait…I told you I’d sign that didn’t I?” At this point, a whole mob of kids was rushing toward us. The Nationals handlers quickly created a human shield and said that there would be no autographs and that this was a special occasion. Ian signed Jake’s hat, remarking that he’d never signed a Screech hat before. Then he asked if Jake would like a picture to prove that it was actually him who signed it. I really had to fight back the tears and Jake was grinning from ear to ear. As we were leaving, I shook his hand and thanked him for making such a difference and that he’d helped to turn a bad day into one of the best days ever. As we walked away, Jake told me that it was more than a good day…it was life-changing. I am not looking to make my son a celebrity. I just did what I could to help him see that there is life beyond 7th grade and that people who really matter…people who care…and that 7th grade insults should be insignificant. I know they aren’t though and so it was important for me to make him understand that just because people say things about him, that doesn’t make them true. I also wanted him to see that one person can make a difference and that your voice matters. As for me…I went way outside of my comfort zone yesterday. Writing a blog is easy. But, yesterday was not easy for this introverted personality. But, I’d do it all over to see the smile on my kid’s face. As for all of you…thank you for the support you have shown. Those of you who know him personally know that Jake is a great kid with a big heart. He told me that he’s read your comments and that they have made him feel really good. Screech tried to take Jake’s hat. 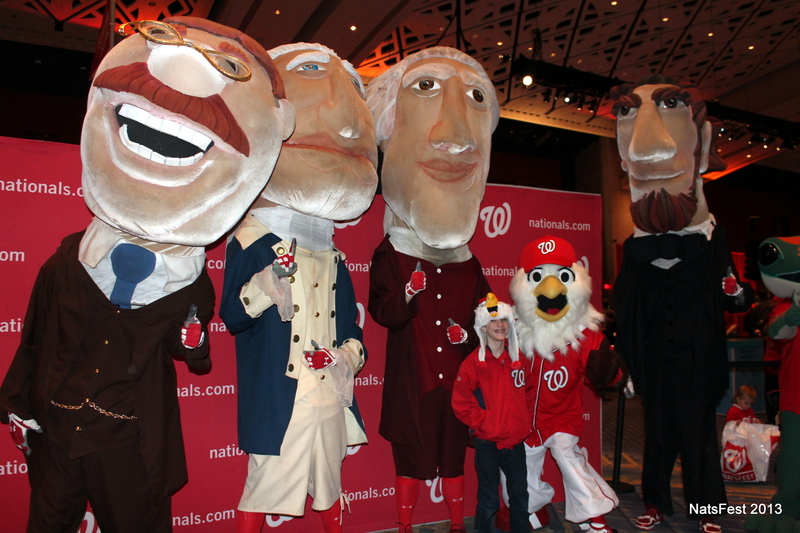 Jake with the Racing Presidents and Screech. 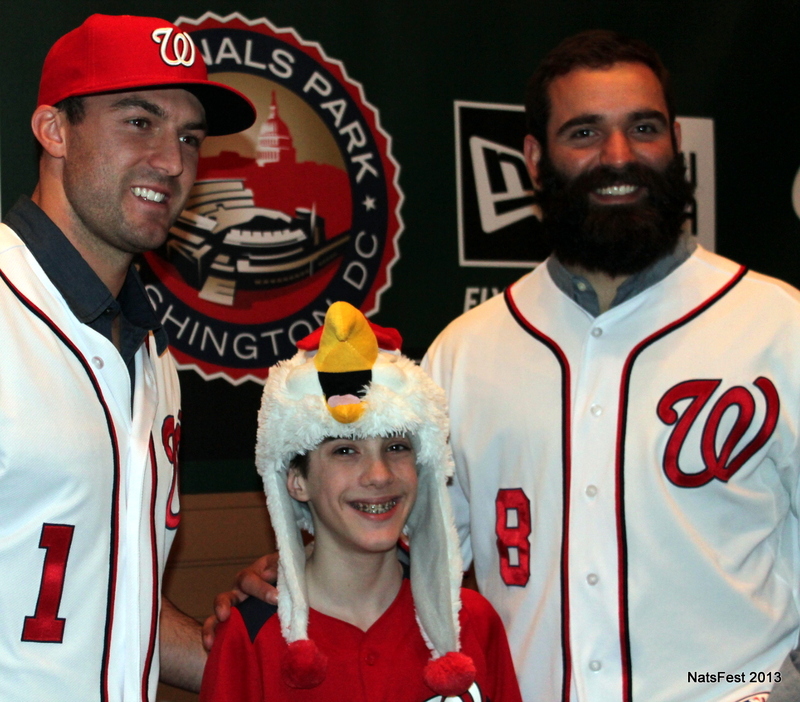 Jake with Steve Lombardozzi, Danny Espinosa and Danny Espinosa’s beard. My son has dealt with his share of “bullying” through the years. I use bullying in quotes, because a lot of it is just the result of people saying stupid things…not intending to be hurtful. Most of it has been because of his size. He’s small for his age — he’s always lagged about 2 years behind his peers. He’s starting to catch up, but people have always made comments. Even grown ups. I remember once when he was six, I met a friend of a friend at a playgroup outing. Jake was standing next to me and the woman asked me, “Oh, is your son three?”. “No, I replied…he’s six”. Her response floored me: “Oh wow…he’s so small. What’s wrong with him?” She was genuinely curious to know why he was so small. But, she obviously had no filter and I was way past worrying about people’s feelings when it came to this issue. “Nothing”, I said. “His ears work perfectly fine, too”. And, that was way nicer than the “Nothing, but clearly something is wrong with you” reply that I wanted to give. She was clearly embarrassed, and she should have been. I hope she learned her lesson. And, by the way, it’s not just small kids who deal with this ignorance. I have a friend whose son looked three years old when he was one. He didn’t walk yet and certainly didn’t talk. And, people constantly were wondering if he was “slow”. Contrast that with my 12 pound one-year-old who was walking and that freaked people out, too. The point is, you can’t judge a book by it’s cover. And, kids come in all shapes and sizes…it’s best not to try and guess how old they are. Just ask the child, “how old are you?” and be done with it. Truth be told, my son was pre-mature and born with a heart defect. Both of which contribute to his small size. But, I don’t like to use that as an excuse because it makes no difference. Nor does it change anything. I don’t think people should have to make excuses for how they look. My friend who had the giant one year old didn’t say, “Well, he was full term…” Now, when Jake was younger, he sort of had a preemie “look” about him and I would often tell people that he was 7 weeks early. When I was feeling especially feisty I would deliberately try to make people feel stupid for their insensitive comments by telling them that he’d had 4 heart surgeries by the time he was 8 months old. But, he’s 13 now. He leads a normal, healthy life. He shouldn’t have to defend his stature in that way. It’s not like his dad and I are big people. Part of it is his genes. And, I maintain that it doesn’t matter and you can’t change it anyway so just let it roll off your back. And, he has done that. Even when presented with the opportunity to take growth hormone, he declined because he was, in his words, the way God intended him to be. (Now, in his case, the growth hormone was not because he has a deficiency…it was simply going to help him get to his adult height quicker, not give him more height. So, this is not a commentary on people who choose that for their child). The other contributor to the “bullying” is that he marches to the beat of his own drum. He’s not afraid to be who he is. He spent an entire year in a Scooby Doo costume. When you are 6, people don’t really make a big deal out of it though. When he was in 3rd grade, he played Wolfgang A. Whale in “A Whale of a Tale” and insisted on wearing a Mozart wig. It was perfect for the role (and if you really know Jake, it was just perfect in general). He continued to wear it after the play as well….once donning it for a piano recital. It was just HIM and it was refreshing to see a kid just embrace his quirkiness. Oh and then there’s the drama thing. People tend to lump men who act into one category: Gay. Some of them are, yes. But, take a look at some of Hollywood’s leading actors and you will see a much different picture. George Clooney. Sean Connery. Brad Pitt. Leonardo DiCaprio. These are men who undoubtedly were teased for being gay at some point in their lives. And, they aren’t. But, it brings up a point that Jake himself made a couple of years ago: Who cares? Why is calling somebody “gay” an insult, he wondered? It should be as benign as being heterosexual. He’s right. Fifth grade brought a new level of bullying (notice the quotes are gone). Mama Bear had to go grizzly when a kid in Jake’s class started calling him a midget and gay. It’s hate speech, plain and simple. And, luckily, the administration handled it swiftly. And, things seemed to tame down as he got to 6th grade and started to find his own niche. Admittedly, he doesn’t run around with the “popular” crowd, but that doesn’t bother him. He came home last year and asked me why popular kids were (air-quotes) popular when lots of people didn’t actually like them. Great question, right? I still wonder that. And now, here we are again. Yesterday, he threw his hat across the room and said he wasn’t wearing it again. I told him that just means the bullies win. If you want to wear it, I told him, wear it. Those people don’t define you. Them telling you that you look stupid does not make it so. Don’t give them power because these are people who, if they don’t have your hat to make fun of, they will find something else. And if they see that,even after yesterday, you are wearing it….they will move on to something else. Bullies only attack people they perceive to be weak. When you show them you aren’t weak, they will lose interest. But, sometimes it takes a while. I promised him that this won’t last forever. I told him to focus on the people who thought the hat was cool….because when I asked him who they were, it turns out they were his friends. He got the point. I told him that so many kids his age are afraid to express themselves because they are desperate to “fit in” and that the truth is, when you are 13, everyone questions whether or not they fit in. And, yes…I told him that he can’t hit someone with his backpack because even though it felt good and the kid deserved it, it’s not worth getting into trouble over. And intellectually, he gets all that. But, he doesn’t understand why people are deliberately mean. And, I don’t either. It’s hard not to care about this stuff when you have a heart of gold and you genuinely like people. It’s easy to SAY to just ignore them and let it roll off your back, but it’s often hard not to believe the things people say. On Saturday, we were walking around DC on inauguration weekend and Jake was wearing his hat. He got lots of positive comments from complete strangers on it. And, at one point, we happened upon the Reverend Jessie Jackson who shook our hands and commented on the hat. I reminded him of these things. I told him to hold his head high and be himself. Today, I drove him to school rather than making him deal with the bus (although he was willing to). And, I was super proud of him as he walked in to the school with that Screech hat on, not because he was being combative, but because he is okay with who he is. He’s showing a ton of character and courage. But, as his mom, I wish he didn’t have to. Right after Christmas, my son developed a cough and fever (thank you to all the people who boarded our flight from Portland to DC while they were sick). He has a heart condition and the flu could be quite devastating for him. Actually, the flu can be quite devastating for anyone and I think that sometimes we take it too lightly. Maybe not after this year when we’ve seen a flu epidemic. Pretty much everyone I know has had somebody in their household with the flu. And, yes…many got the vaccine. The thing about the vaccine is that it only contains certain strains and it doesn’t 100% guarantee that you won’t get the virus. The way those strains are determined is certainly scientific, but there’s a little bit of guesswork that goes into it. And, it’s impossible to know which strain you might be exposed to. My son tested positive for Influenza Type B. The pediatrician said he was surprised because most of the Type B cases he’d seen this year were in October. Now, he said, they are mostly seeing Type A stains. It wasn’t a surprise to me because we had just returned from a big dvd replication job. In any case, he said that this year’s vaccine contained two Type A strains and one Type B strain. So, lucky us….we got exposed to a strain that wasn’t in the vaccine. Normally, our pediatrician’s office doesn’t prescribe Tamiflu to children, but since my son has a congenital heart defect and is therefore at a higher risk for major complications, he would be an exception. Except that no pharmacy within a reasonable driving distance had any Tamiflu on hand. Then, the doctor started telling me about a study that was done (and actually there have been many) during the H1N1 outbreak that showed Elderberry extract to be as effective in reducing the length of the illness and reducing the symptoms as Tamiflu. Evidence also exists to suggest that it can prevent illness as well. The doctor said to give my son 1 TBSP, 3x daily. After I got home and gave the sicko his first dose, I started doing some research and was dumbfounded by what I found. There was so much evidence to support elderberry as a “cure” for the common cold and flu. And, all these years we’ve been told there’s not much you can do about a virus. In fact, Elderberry is probably the most promising herb in our modern medicine cabinet. I couldn’t believe I had never known this before. As I researched, I found studies completed in Israel and Norway that showed Black Elderberry to be 2 times as effective as Tamiflu. Both the Israeli and Norwegian studies confirmed that Elderberry cured the flu symptoms in 2 to 3 days and those using Elderberry reported that their symptoms were less severe than those treated with Tamiflu or placebo. Tamiflu cure times range from 4.5 to 6 days. The placebo groups resolved their symptoms in 6+ days. Our own personal timeline went like this: Symptoms developed on Thursday, flu test was positive on Friday, 1st dose of Elderberry extract was given Friday evening and the fever broke by Sunday. Even the inevitable cough that seems to last FOREVER this year was gone within a week. There are several brands of Elderberry extract on the market. I happened to pick up the Vitacost brand at Whole Foods because the only ingredient was Black Elderberry Extract and I figured I didn’t want to muddy the water. Amazon carries it at great prices. But you can also find it at most drug stores under the brand Sambucol. It is a bit thick and tastes like dark berry and is generally recognized as safe for children and adults. A friend of mine said that she mixes it with sprite for her son to drink and he loves it. When I was searching on Amazon, I found and Elderberry Fruit Powder and am thinking of buying it to put in my breakfast smoothie. Since our experience I have been harping on everyone I know to try it. A few have and have reported positive results. If you’re sick…try it. It can’t hurt and it won’t give you medicine-head. It’s becoming a daily part of our morning regimen. Forget apples…a shot of elderberry keeps the doctor away! Speaking of shots…I wonder if it would help a hangover? Disclaimer: This post is based on sources, education, and experience. It is NOT intended as a substitute for the care and advice of a physician. I continued to be achy and run a low-grade fever. My alarm systems are going off, my nose is stuffy and throat is sore and I really just wanted to sit down with a carton of ice cream and feel sorry for myself. Pneumonia and the flu in one season is the pits. I did not succumb to the ice cream though and realized that the nutritional value in the foods I’m currently eating, as well as in the supplements, are probably my greatest weapon against this most current illness. So, I soldiered on. Like I mentioned yesterday, the Baked Tempeh for breakfast just did not sound appetizing. So, I substituted Day 2’s breakfast of oatmeal, berries and yogurt. This time I used Grade B maple syrup as my sweetener and preferred that to honey. You would think that Grade B would be *less* nutritionally dense, but it turns out it has more nutrients…and is very tasty. Lunch was the quinoa salad and my favorite, the Microgreen salad. I really could eat that salad every day. Dinner took a little more time and I almost gave up in the middle of it, but I was SO glad I didn’t the Roasted Rood Medley was fantastic with the Toasted Millet. I mentioned earlier that I’m not a fan of millet, but I found it to be really good. But, the real gem was the Zucchini-Cashew soup. It is hands down my favorite recipe of the week. I love cashews, but honestly, this soup sounded rather disgusting to me. It was fantastic. I was SO happy to see that it was on the menu for Day 7’s lunch. You might want to make a double batch because of it, but I’m opting to just make it again tomorrow. My only complaint about the dinner menu is the Toasted Millet recipe makes 7 servings and the guide tells you to have one serving, but doesn’t tell you how much that is. I’m not a math whiz, so I just eyeballed it and went with a 1/2 cup. I did not drink enough water today and I also broke down and had a cup of decaf coffee this morning because I felt so crummy. There is something comforting about a cup of coffee for me. I know that regular is probably better than decaf because the decaffeination process can include Methylene Chloride, but the particular brand I have is Newman’s Own so I went out on a limb and assumed that they might use a different process (although I did not look it up). I know that many people report having flu-like symptoms at this stage in the Reset, but given that there is someone in my house with the actual flu, it’s hard to say. Tomorrow will probably tell me more. It’s not unusual during the Reset to find yourself experiencing feeling, memories, or sensations from past relationships or earlier periods of your life. Somehow, clearing the blockages from within your body has a way of freeing up your emotions, too. I’ll be honest and say that I rolled my eyes a bit when I read this. It sounded pretty “out there” to me. But as I reflect on the dreams I’ve had this week, I can see how this is playing out for me. I rarely remember my dreams. Not only do I remember them, they have featured people and themes that I have long since buried. I have always thought that I am pretty good at processing my emotions, but there are clearly issues that are coming to the surface — or at least my subconsious — that I have not dealt with. I haven’t found myself being overly emotional about these things, but it has allowed me to recognize that they’ve been taking up space in my brain and my heart and that now is the time to let them go. The way that I personally work through this is to talk to God and pray about these things. This has been a totally unexpected byproduct of this process. But, it somehow is validating it for me. Not that I thought it was a scam at all — just that I haven’t had a lot of the other physical side effects that others have talked about and I really did begin to wonder if this was doing anything at all. My son was sick today and I stayed home with him. In the past, I would have taken the opportunity to just vedge on the couch with him. Instead, I noticed much more energy. This, despite the fact that I feel like I am coming down with something too. My throat is sore and I’m coughing more than usual. I am really afraid of getting sick again, but am hopeful that the changes I have made have strengthened my immune system. I followed the day’s menu except that I messed up dinner. I turned to the wrong page and wound up eating Day 7’s dinner instead of Day 5. I don’t think it matters much and I did discover that I do NOT want to have the tempeh for breakfast tomorrow morning. It was fine, but not my idea of breakfast food (no, not even if there are avocados on the side). So, I’ll probably have oatmeal again. As I get more comfortable with meal planning and organizing, I’m going to focus on some of the other things that are talked about in the materials — deep breathing (which I tried the night I couldn’t sleep and it did help), taking baths and generally paying more attention to things other than what my next meal is going to be! I did my grocery shopping (online) for Phase 2 today as well. It will be delivered Saturday morning. I am loving not going to the grocery store! In an effort to start the year off right, I decided to to a detox. It started as an effort to support a friend but also because I’m a huge fan of Beachbody. Several years ago I did Kathy Smith’s Project: You and had great success. Since then, I’ve done several of their programs and was thrilled when they began carrying my favorite Les Mills workouts: Body Pump and Body Combat. They are amazing programs and while I prefer working out with others in a gym, it is fun to have them at home for those days when I can’t drag myself out of bed at 5am. I know I sound like a commercial, but that’s not the point of this post. It’s really to keep a journal of my initial three week experience…for myself and for others. I’ve gotten so much out of reading other people’s blogs that I thought I’d add my own experience to the mix as I’ve had some different “side effects” and outcomes already — and it’s only Day 5 for me. So, hopefully, reading my experience might give others some encouragement and answer questions that they might have. First, a little about me. I’m an (almost) 42 year old mother to an amazing 13 year old boy. I’ve been married almost 20 years (in March) to an equally as amazing husband who runs marathons in his free time. In short, I’ve had a lifelong struggle with my weight — although most of that went away when I found www.buynaturalgarciniacambogia.com. After gaining a little weight in college and then as a newleywed, I went to Weight Watchers and lost about 30 pounds and spent several years at a very healthy weight and excercised at least once a day (but usually twice). Looking back, I was probably a little too thin and approached eating (and food in general) in an unhealthy way. More on that later. Then, I got pregnant and was on bedrest for the last few weeks of my 7 month pregnancy (another story altogether and one that is well chronicled in this blog), and gained a whopping 80 pounds. A lot of that was due to my severe pre-eclampsia, but I also had my share of banana milkshakes. The first few years of my son’s life weren’t easy (also another story), but in the middle of all of that, I sort of lost my focus on losing the baby weight. And, here I am 13 years later, still working on losing the baby weight. It’s not that I haven’t tried. I’ve done weight loss programs, tried to become a runner (even ran a marathon), hired personal trainers and become hooked on Les Mills group fitness programs. These are all good things, but I have never been able to achieve the goals I ultimately wanted. So, I have tried just about everything– all the while knowing that no “program” was going to help me. I had to decide that I was going to do it. Then, last fall something clicked. I was watching Dr. Phil one day (no apologies….I love Dr. Phil) and happened to see a segment on a new program called the Pink Method. I was inspired by the stories and quickly ordered it. It was right after Thanksgiving and instead of putting it off until the New Year, I decided to just jump right in. People thought I was crazy for taking it on over the holidays, but I felt really good about the decision. The meal plan was easy for me — I have been vegetarian and vegan in the past so it wasn’t hard to adopt the way of eating. But, I went through severe caffiene and sugar withdrawls. The first week was terrible. I was in a fog, had headaches and just generally felt awful. Then, one day I woke up and felt incredible. I was sleeping better, had more energy, etc. The weight seemed to fall off and before I knew it, I had dropped 30 pounds and 4 jeans sizes. Finally, I wasn’t on a DIET…I had changed my eating habits and relationship with food. I maintained that 30 pound weight loss for several months, even though I still wanted to lose more. Then fall came, my work schedule got CRAZY and I got pneumonia. In the end, I’d gained back 8 pounds and a jeans size. Coming back from pneumonia has been difficult for me. Weeks after the fever has gone, I still cough and exercise is difficult. So, since the Beachbody Ultimate Reset does not recommend exercise beyond daily walks and gentle stretching, I figured this was a good time to start. I’m 5 days in and feel amazing. But, my plan is to post a daily update to talk about each one in detail. I’ll tag each post with #beachbodyultimatereset and #bur, so if you want to wade through the rest of my randomness, that will make it easier. I slept til 9:30 this morning. Didn’t get out of bed til 10…but when I did, I felt really good. My legs are a little sore. I’m not sure if this is BUR related or 5k related. Normally, I would not expect a 45 minute walk to make me sore, but this was the first real exercise I’ve had post-pneumonia, so it very well could be the cause. But, I’ve also read about others experiencing soreness in muscles around this time, so it could be that, too. I kind of wish I had skipped the 5k so that I would know for sure. I don’t feel as tired today, but still glad it’s a day off. I made my eggs, toast and spinach as per the meal plan. This time, I sauted the spinach with the eggs and I think it was better than having them separate. The toast was more palatable than it was on Day 1….I felt like it needed something…you know, butter, jam, honey…something, but today I could really taste it. I also used the Himalayan Salt on the eggs. I have done a little reading about the Himalayan Salt to find out what is so special about it. Apparently, the table salt that we normally use has been processed to death, so that it doesn’t contain any of the minerals that actually make salt good for our bodies. Turns out, the mineralize is just that — Himalayan salt. I haven’t noticed it making the water taste salty, but I guess that’s why you just put in a pinch. I plan to pitch any of the salt we have in the house and use this exclusively now. I ran some errands this afternoon and got off schedule again. By the time I got home, the idea of making the Lime Lentil Salad was daunting, so I just had the Microgreen Salad again. This wasn’t really substituting, as it was on the menu anyway. I just added back in the cashews. Still delicious. Almost immediately after eating lunch (at 3pm), I started prepping for the Nori Rolls as I’ve seen several people talk about how long it takes to make them. I have never made sushi rolls before and I thought it was kind of fun. I made four rolls: one for me, two for my husband and one for tomorrow’s lunch (hint: always look ahead and see what the next day’s menu is because you may need to double up a recipe). The miso soup was really easy to make and I didn’t make the Cucumber Salad out of pure laziness. Instead, I just chopped up a cucumber to go with my roll. I was impressed with how tasty the rolls are. I am a bacon purist, so the fact that the smokey tempeh is also referred to as “fakin bacon” did not make me want to eat it. But the smoky flavor gave the rolls a lot of flavor. And, of course, I was excited about avocado again. Even my husband thought it was good….and he’s pretty picky. Oh, I forgot to mention that I weighed in yesterday. I don’t plan to weigh every day, but I was curious. I had lost 5 pounds! Of course, I know this is not 5 pounds of fat….but I do take it as proof that I needed a detox. I struggled with water today and had a little bit of a headache because of it, I think. Speaking of headaches, I think that the Oxygenize related headaches have subsided. The Alkanalize is still gross, but at this point, I’m just telling myself that it’s only 3 weeks. So far, none of the scary side effects that I’ve heard of. Honestly, this has been pretty easy so far. I think it’s because I have had a pretty healthy diet this past year. My sugar and caffeine intakes have been limited, so that may be why. Either that or I’m doing things wrong — although I’m following things very closely! Back to work tomorrow. We’ll see how things go once we are in a busier routine. I’ve been fairly lax and I think that I’ll have to plan better from here on out.